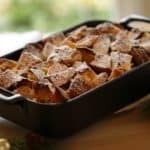 Italian Panettone Bread Pudding. The easiest holiday dessert ever! It can be made the day before and baked off when you sit down to dinner. Spay a 12 x 9 (30cm x 23cm) casserole dish with baking spray. Cut panettone into 1” (2.5cm) cubes and place in casserole. In a large pyrex pitcher whisk together eggs, sugar, heavy cream, vanilla, nutmeg, cloves, cinnamon and salt. Pour mixture evenly over panettone. Cover and refrigerate. This can be done the day before or 4 hours before. Bake for 30 mins covered and then 10-15 mins uncovered until the pudding has puffed up and is golden brown. Sprinkle with powdered sugar and cut into squares. Serve with brandy scented whipped cream.